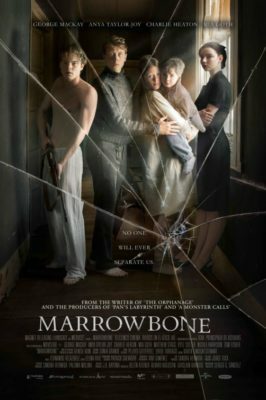 The Marrowbone family lives in secret. In 1969, a young man (George MacKay), his three younger siblings (Mia Goth, Matthew Stagg and STRANGER THINGS’ Charlie Heaton) and mother (Nicola Harrison) move from their treasured home in England to escape their traumatic past and start fresh. They do so by settling into their mother’s family home in a rural American community. But when their mother suddenly falls ill and eventually passes, their clean slate becomes littered with problems. 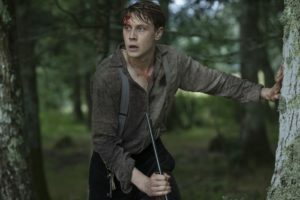 MARROWBONE, a gothic horror movie so small it almost fell under the radar, is deeply rooted in family struggles and the concept of surviving without adult supervision. Even though the oldest brother, Jack, is 21 years old when he inherits the responsibility in protecting them all, he very much embraces a childlike wonder. He runs around with neighbor girl Allie (Anya Taylor-Joy), a charming librarian, and longs to live a life that’s not restricted by circumstance. Oh yeah. There are also some hauntings going on in the house. To dive too deep into these hauntings would spoil the ending, because, for most of the two-hour running time, the audience is left in the dark to piece together the mysterious narrative. We get hints and subtle visual clues as to what the stir of echoes may be about. But we’re primarily left to wonder whether the house is haunted, or if the family has a ghost that’s following them. All we know is the family doesn’t like mirrors and some creepy noises are coming from their ceilings. Whatever you’re thinking, those moments prove to be chilling. George MacKay is Jack in the Magnet film, Marrowbone. Courtesy photo. MARROWBONE resembles films like SHUTTER ISLAND and CRIMSON PEAK with its themes of loss and disorientation. It’s got filmmaker Guillermo del Toro’s fingerprints all over it — and go figure, because MARROWBONE is written and directed by Sergio G. Sánchez, who wrote the del Toro-produced THE ORPHANAGE. There’s something very classic about the way the story unfolds. Like a del Toro fairy tale (or ghost story), it takes its time to build its characters and narrative, and doesn’t lean too much into the shock factor. There are many good jump scares, especially during a sequence where Heaton’s character crawls down the chimney to fetch something he’s thrown down there. But the most horrifying element of MARROWBONE is its building unease. The tension winds up like a jack-in-the-box toy. Once all the secrets are revealed, many moments become all the more frightening and devastating because of its grand sense of realism. MARROWBONE may frustrate some due to its confusing structure, but how the film preys on your mind and gets under your skin make the journey well worth the plunge. And like movies like SHUTTER ISLAND or THE PRESTIGE, you just may find it necessary to watch it more than once. MARROWBONE opens in limited release this week and will also be available on Video-On-Demand.